In late Friday action, Austin Peay’s Sabrina Richman led a trio of Govs with top-eight finishes in the 67-runner field, posting a third-place showing thanks to her personal-best 24.43 mark in the event. Freshman Kyra Wilder won the third heat and placed fifth overall with a personal-best 24.85, while junior Tymeitha Tolbert her first sub-25 second mark of the year, placing eighth at 25.07. Richman is the only runner in the OVC to rank in the top-three in the 200 and 400m dashes heading into the OVC Indoor Championships two weeks from now. Austin Peay saw its Saturday get off to a solid start in the field events thanks to freshman long jumper Camaryn McClelland, who placed seventh thanks to a 5.33m leap on her third attempt. She followed that up with qualification into the 60m hurdles finals with an 8.71 in the semifinals; she joined sophomore Lennex Walker, who qualified second with a personal-best 8.62. McClelland sat in 16th after the preliminary round but qualified for the finals after shaving more than a tenth of a second off her career-best in the semis. McClelland wasn’t finished; her personal-best 11.31m triple jump earned her eighth place, and she again lowered her mark in the 60m hurdle finals with an 8.78 run to finish third, just behind Walker, whose runner-up 8.67 marked three times in her last four attempts she’s been at 8.70 or better. Walker now ranks second in the OVC in the event, with McClelland angling hard for the podium in fourth. Tolbert also earned qualification to the finals in the 60m dash event, racing 7.68 in the preliminary round and 7.62 in semifinals to gain qualification while winning the third heat in the prelims and the second heat in the semis. She would place third overall in the 58-runner field with a 7.61 run in the finals, her fourth top-five in five 60m attempts this season. In the pole vault, senior Savannah Amato reclaimed a spot at the top of the leaderboard, outpacing Florida A&M’s Jazmyn Dennis on jumps at 3.95m to take the top spot; classmate Dascha Hix was third with a 3.80m mark, with sophomore Morgan Bradley fourth with a season-best 3.65m height. In the non-NCAA 1000m run, freshman Molly Howard placed fifth with a 3:12.99 mark. Austin Peay capped the day with a huge win in the 4x400m relay, fending off Tennessee Tech’s quartet to not only win the event with a season-best 3:49.14 but also take over the top spot in the OVC standings as well. Freshman Kyra Wilder led off, with freshman Jessica Kelley keeping pace and Richman closing before handing off to sophomore Allana Johnson, who overtook Tennessee Tech at the final turn to give the Govs the victory. 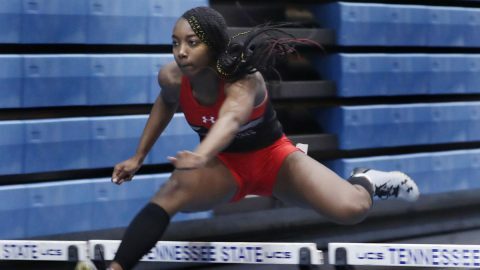 Austin Peay will take next week off to rest up ahead of the 2019 OVC Indoor Championships, Feb. 20-21, in Birmingham.